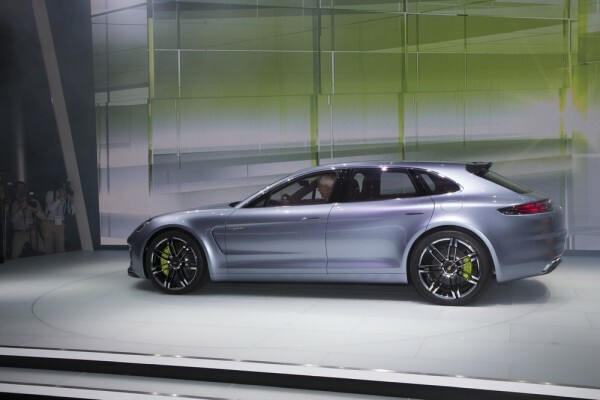 Porsche's calling it a concept, but given the fact that Panamera Sport Turismo shares its ancestry with their current production 4-door sedan and incorporates technology from the upcoming 918 Spyder, I think there's a better than average chance we'll see some version of the Panamera Sport Turismo on showroom floors in the next few years. In the video above, Michael Mauer (Director Porsche Style) explains what went into the creation of the Porsche Panamera Sport Turismo and which design features we might likely see in future models. If you're having trouble viewing the video, simply click on "Pictures, Details, Video and Specification of the Panamera Sport Turismo Concept" to view them directly on our site. Notice how the smooth exterior flows with no interruption, even the door handles are recessed. The paint is the new "Liquid Metal Blue" which will be found as an option on the 918 Spyder. Overall, the Panamera Sport Turismo is 75" wide, stands 55" tall and is 195" long. If you're comparing, today's Panamera is the same length at 195", wider by 8 inches at 83" and slightly taller at 56". Note the lack of conventional exterior side mirrors. Instead, there are two cameras mounted in the side air outlets just behind the front wheels. The driver sees the view from the side cameras on the TFT display in the cockpit. Blinkers and side lights are integrated in a C-shaped lighting unit - Porsche's calling them C-Blades - mounted into the large air inlets on the front-end. The headlights consist of a four point LED array that give the Panamera Sport Turismo its unique look. Perhaps most remarkable is the reshaped rear-end. It's hard to tell from the pictures, but the Porsche badge is actually sculpted in three dimensions. The rear carbon spoiler is functional producing improved downforce. 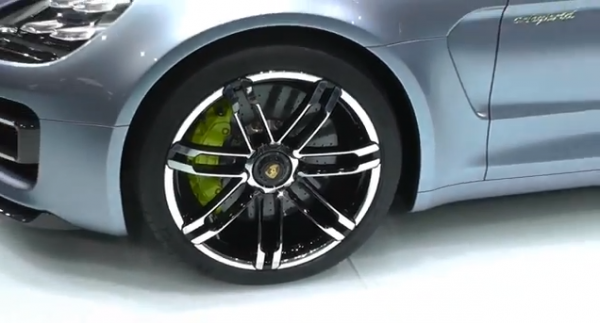 Center locking, dual spoke wheels are complimented by brake calipers painted in Acid Green (a color that is found on many cosmetic features of the Panamera Sport Turismo). Unlike Porsche's current hybrids, the Panamera Sport Turismo is a true plug-in hybrid meaning the batteries can both recapture energy while driving or get recharged at home. The wall mounted charging interface allows the fluid-cooled lithium-ion battery to be externally charged in just 2.5 hours using a standardized plug. Once charged, the concept vehicle is said to be capable of speeds up to 80 mph and can cover nearly 20 miles in all electric mode. Combined, the Panamera Sport Turismo has 416 hp between the 333 hp supercharged V6 and the 95 hp electric motor. Porsche claims zero to 60 times of less than six seconds. Similar to what we recently saw of the Porsche 918 Spyder interior, the Sport Turismo uses an iPad like touch sensitive display on the center console to control the e-hybrid functions and a center mounted TFT color display provides the tach, navigation, side camera views and other driving data. Like the Panamera, the Sport Turismo concept is a true four seater with sport seats in the back and what is presumably enough headroom for the tallest of passengers. Of course, you can't drive your Porsche with your phone. However, you can do everything from viewing remaining battery charge to operating the vehicles climate control all from the palm of your hand. Check out our post on the Porsche's mobile communications app for more details on this feature. I don't know about you, but I would seriously consider trading in my Cayenne for this Porsche wagon. Talk about the ultimate "dog hauler". Did You Miss Porsche's Paris Press Conference. Watch it Now! Can’t Remember Where You Parked Your Porsche? There’s an App for That!